Review written by and copyright: Eric Cotenas (24th May 2018). Johns Hopkins biologist Lena (Jackie's Natalie Portman) has been mourning her husband special forces husband Kane (Mojave's Oscar Isaac) ever since he went on a classified mission a year ago and failed to return. When he appears out of the blue, he is maddeningly vague about what happened to him but goes into arrest before she can get any more information out of him. On the ride to the hospital, the ambulance is forced off the road by military vehicles and Lena sedated when she tries to intervene in their removal of dying Kane from the ambulance. Lena wakes up in a military complex in the company of Dr. Ventress (Singel White Female's Jennifer Jason Leigh) who informs her that they are in Florida in the most recent outpost of "The Shimmer," a strange phenomenon that landed as an asteroid at the lighthouse in Blackwater National Park from which an electromagnetic field has been gradually spreading outward in a widening radius. Teams sent in to investigate over the past three years have failed to return, apart from Lena's husband who is now dying from multiple organ failure. Haunted by not knowing what would have lead her husband to volunteer on a certain suicide mission, Lena asks to be part of the next expedition which will be led by Ventress herself with a team consisting of young physicist Josie (Thor: Ragnarok's Tessa Thompson), anthropologist Cassie (ID:A's Tuva Novotny), and paramedic Anya (Deepwater Horizon's Gina Rodriguez). They emerge on the other side of "The Shimmer" with no recollection of how the crossing, waking up seemingly days later with their equipment set up and a few days worth of rations consumed. As they explore, they discover that something has altered not only the plants but also the animal life they are nearly killed by an albino alligator with multiple rows of teeth like those of a shark. Settling for the night in the previous outpost, they discover a memory stick addressed to "those who follow" in which Kane is show slicing open the stomach of another soldier (Wonder Woman's Sammy Hayman) revealing intestines that appear to be moving on their own. Anya dismisses it as a shock reaction and surmises that the previous teams all went crazy and murdered each other until they find the soldier's remains that have erupted into a strange assortment of malformed bones and organs covered in cancerous tumors. That night, Lena and Ventress on guard witness Cassie is carried off by a bear, and Lena discovers her body the next morning as they search out Ville Perdue, a settlement closer to the lighthouse. Anya and Josie want to leave, but Ventress wants to continue onto the lighthouse even if she has to do it alone. Not wanting to take sides, but also driven by her morbid curiosity, Lena suggests that heading in the direction of the lighthouse is a means of getting to the sea and the perimeter of The Shimmer. Human-shaped trees at Ville Perdue lead Josie to surmise that The Shimmer is acting as a literal prism and refracting everything back upon itself including the DNA of various species and recombining them into mutations. As the knowledge that they most certainly have been contaminated and are already undergoing changes, they each react differently, from paranoid and violent, accepting, or fighting it as they what they once were and may become in unpredictable ways. Based on the first novel in the "Southern Reach Trilogy" by Jeff VanderMeer, Annihilation as realized by writer/director Alex Garland (Ex Machina) is a ravishingly beautiful and intellectually-stimulating yet imperfect piece of big screen science fiction. Classic science fiction traded on the Cold War fears of a loss of individuality and notions of what makes us human, whereas Annihilation exists in a world in which people are incomplete, they do not know themselves and come to realize that they do not know their loved ones, and the horrible fate that awaits them is not death, zombification, or becoming a pod person, but being broken down to the most basic elements beyond the individual and the random recombination of elements that either are entirely unrelated to the individual or are only a literal echo of what they once were (for instance, the death screams of a victim incorporated into the roar of the animal that killed them). Lena's curiosity about what made her husband volunteer to go on a "suicide mission" prompts an observation that she is "confusing suicide with self-destruction" the impulses of which might be biologically-programmed into humans, and it is this prompting which leads the viewer to wonder if the guilt Lena feels over what appears at first to be flashbacks to Lena betraying her husband's memory with colleague Dan (Interstellar's David Gyasi) may be such a self-destructive act actually predating Kane's final mission. The theme of self-destruction and its relation to the whether the alien force is destroying or remaking what it encounters is otherwise unevenly explored, favoring heavy-handed symbolism with each of the expedition members literally defined by loss but only Lena's loss explored, suggesting that Lena only survives (more or less) because she has something to come back to while the fight in others is only externalized in death. This is perhaps necessary since the film is told in flashback by Lena – who, as in many a film featuring the interrogation of a female protagonist by a male, the supposedly objective inquiry seems to inappropriately veer towards inquisition – but the problem is that Garland does not know when to stop, constantly returning to fragments of flashback to the souring relationship between Lena and Kane, disrupting the momentum of the story and just flat out boring the viewer since the scenes themselves are uninteresting, and Portman and Isaac have no chemistry together. Another odd misstep is the terrible Southern accent adopted by a character late in the film, one whose dialogue earlier on has been of the muttered "mumblecore" variety. In retrospect, it may suggest that this character has taken on the voice of another (although he seems to be speaking his own words, not echoing others), but it just seems like flagrantly bad acting and a poor performance choice that simply distracts. Performances hardly liven up the sketchily-rendered characters because they are meant to all be damaged in one way or another, speaking of their pasts in a resigned manner, with only fear bringing out a trace of vulnerability. What remains to savor is the cinematography of Rob Hardy (Red Riding 1974), the production design of Mark Digby (Slumdog Millionaire), the digital visual effects, and the sculptural beauty of make-up effects creations of Tristan Versluis (Game of Thrones). Given brief theatrical release in the United States by Paramount – while it oddly went direct to Netflix in many other markets – Annihilation is an accomplished piece of technical filmmaking with some conceptual problems that prevent it from being satisfying as a work of thinking person's science fiction. Shot in 6K and mastered in 4K, Annihilation's 1080p24 MPEG-4 AVC 2.40:1 widescreen Blu-ray transfer looks truly state of the art with ravishingly crisp detail in spite of the real and digitally-created lens flares that have a reason to exist within "The Shimmer" while most of the digital effects hold up better than the make-up effects. A 4K UltraHD edition also exists, but it is currently a Best Buy exclusive edition with no street date set for other retailers. The primary audio option is Dolby Atmos and it mixes down to 5.1 nicely, sounding more enveloping than the Dolby Digital 5.1 Descriptive Audio track or the Dolby Digital 5.1 track on the combo's DVD set. We were not able to sample the disc with an Atmos or DTS:X setup, but the vertical component presumably is made up of some directional effects passing overhead amidst a wider distribution of the soundtrack's atmospheric elements. French and Spanish Dolby Digital 5.1 dubs are also included along with English, English SDH, French, and Spanish subtitle options. The disc includes roughly an hour, divided into three sections. Part 1: Southern Reach (26:15) consists of Refractions (11:20), focusing on the origins of the story, and For Those That Follow (15:04) covering the film's casting. Part 2: Area X (27:07) includes Shimmer (12:12) on the location shooting in Berkshire's Windsor Great Park, while Vanished Into Havoc (15:03) looks at the film's visual effects. Part 3: To the Lighthouse (19:43) features Unfathomable Mind (11:49) covering he film's conceptual designs while The Last Phase (8:06) has the cast and crew discussing Garland's direction. 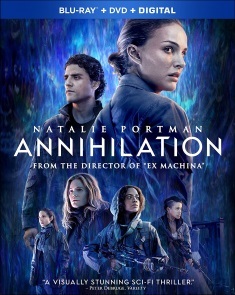 Given brief theatrical release in the United States by Paramount – while it oddly went direct to Netflix in many other markets – Annihilation is an accomplished piece of technical filmmaking with some conceptual problems that prevent it from being satisfying as a work of thinking person's science fiction.